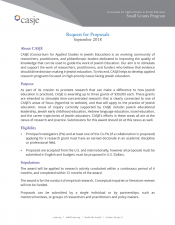 CASJE (Consortium for Applied Studies in Jewish Education) is an evolving community of researchers, practitioners, and philanthropic leaders dedicated to improving the quality of knowledge that can be used to guide the work of Jewish Education. Our aim is to stimulate and support the work of researchers, practitioners, and funders who believe that evidence should drive decision-making in Jewish education. To this end, CASJE helps to develop applied research programs focused on high-priority issues facing Jewish education. As part of its mission to promote research that can make a difference to how Jewish education is practiced, CASJE is awarding up to three grants of $30,000 each. These grants are intended to stimulate time-concentrated research that is clearly connected to one of CASJE’s areas of focus, and that will apply to the practice of Jewish education. Areas of inquiry currently supported by CASJE include: Jewish educational leadership, Jewish early childhood education, Hebrew language education, Israel education, and the career trajectories of Jewish educators. CASJE’s efforts in these areas all are at the nexus of research and practice. Submissions for this award should sit at this nexus as well. Read about the 2018 small research grant recipients. Read about the 2017 small research grant recipients. The submission period for proposals is closed. Thank you to everyone who submitted proposals.